Nothing tugs at a mamas heart strings more than her last baby growing out of newborn size clothes, or newborn diapers, or needing the newborn insert removed from the car seat. You passed all three milestones at once, right around six weeks. You’re now up to 10lbs, and the 30th percentile for weight. There’s no denying that my itty bitty is growing. I’m trying to soak in as much of your newness as you as I can; your velvety soft skin, the sweet new baby smell, the silky soft hair atop your head and the peach fuzz in back. As happy as I am to see you growing, a piece of me wishes you’d stay this way forever. 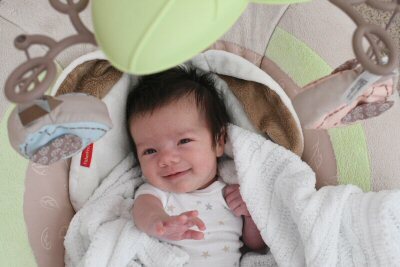 New things you are doing this past month include smiling, holding, and coo-cooing. 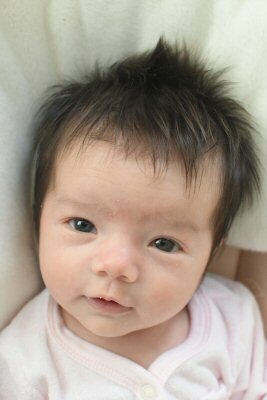 You started smiling just after you turned one month. You’re still really good at what Daddy and I call “concern face”, a furrowed brow and skeptical stair, but now you’ll just back and forth between the biggest smiles and concern. In terms of holding your very good at clenching your fist around my hair when I hold you, and once held onto the hem of my shirt when you wanted to nurse. You’re even good at hooking the toys of your gym with your toes. I thought it was just coincidence, but you’ve done it multiple days and I have the photographic evidence! You’re not grabbing yet, but should something venture near you, it’s yours. We’ve been working on napping in the crib, and I’m happy to report it’s getting easier. You’ve had two long siestas (2 and 3 hours) and a whole bunch of half hour catnaps. At night you’ve blessed us with some 10-11 hour stretches, although 7-8 is more typical, and there are some days you wake up after just 5 for a feed. We’re still not on much of a consistent schedule, but we’re getting there. I can time the morning nap fairly reliably at this point. Once the afternoon hits I’m fallowing your lead when it comes to nap time. You have discovered your fist and have given up interest in your binky. I even tried different types of binkis. No dice. Your fist is far superior. This month we’ll be introducing you to the bottle. Your two big sisters are eager to lend a helping hand!